Looking to get fit? If you are then you’re definitely not alone. There are a number of people who are trying to get in better shape and looking for any ways that they can possibly find to make sure that it happens. Well, the best indoor exercise bikes are definitely one way that you can go about just that. You’ll be able to work out in the comfort of your own home and you can rest assured that you’ll have a great tool to do it with because our indoor bike buying guide will point you in the right direction. Weight Capacity: How much weight is the bike able to hold? Will you be able to use it comfortably? You don’t want to get too close to the weight capacity or you could struggle with the bike or your own comfort. Foldable: Can you fold it down when it’s not being used and get it out of the way? This might not be as important for some but others might need to keep their space clear, especially if you don’t have a lot of it at home. 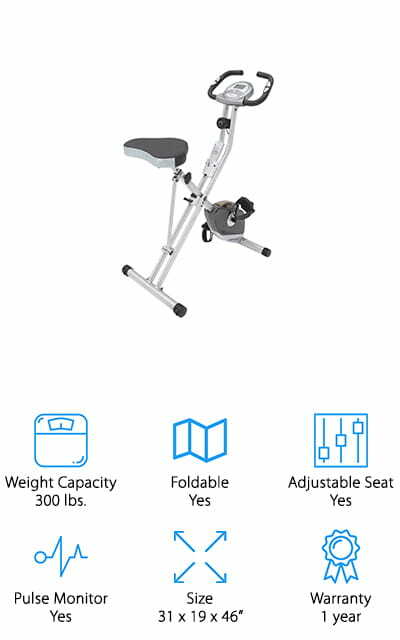 Adjustable Seat:This is definitely going to be important for you to be as comfortable as you want to be and to make sure the bike fits you properly. Being able to adjust the seat ensures a great fit and great workout. Pulse Monitor: Does it keep track of your pulse and let you know how you’re doing? This isn’t a feature on all exercise bikes but it can help you know if you’re getting a healthy workout or if you need to step it up (or slow it down). Size: Just how much space does the bike take up when it’s fully put together? Is it large and in need of plenty of space or is it smaller and can be easily tucked away somewhere you may not even notice it? You’ll want to know. Warranty: How long of a warranty is on the bike? A long warranty means the company stands behind the product and that’s definitely a benefit. You may want to look for something that’s at least a couple years for your own comfort. There are plenty of exercise bikes out there and you may have no idea just where to even begin looking. That’s why we’ve done some of the work for you. We’ve found 10 of the top exercise bikes (or at least we think so) that you can find right now. 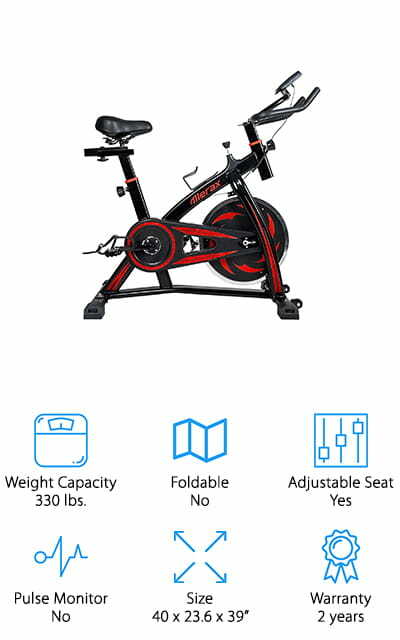 All you need to do is take a look at our indoor bike reviews and indoor bike trainer reviews to decide which one is going to get the job done for you the best. This indoor spin bike is our top pick for a reason. It has a lot of great capabilities and features. Included in the system are the bike itself, a floor mat to put it on, a media tray, and stretch pads. All you do is connect your smartphone to keep track of data or connect to the system itself to get a 3D cycling option. You’ll definitely have fun cycling through just about anywhere you could imagine. When it comes to comfort you can adjust the handlebars in one of 4 different ways and the seat adjusts to get just the right height for you. The design of the bike is sleek and modern, the screen is easy to read while you ride and it has a water bottle holder for your exercise needs. When you need to move it out of the way the wheels on the base make it even easier, and it’s not too heavy even on its own. You can’t go wrong with our best cheap indoor bike because this one is inexpensive but still gives you a lot of what you’re looking for. It offers a weight capacity of up to 300 pounds and sits easily on your hard surface floors. The larger seat cushion means that you won’t have a problem getting comfortable and you can adjust the seat from 5’3” to 6’1” users. There’s even a hand pulse monitor that will help you keep track of your workout and your overall health as well. When you’re using it you can fold it down quickly and easily, but if you need the space just fold it up and roll it away, anywhere you want. The tension system uses magnets and has 8 different levels, to make it just the right workout for your needs. You’ll even get a large LCD display for all the information and a 1 year limited warranty. Here we have a moderately priced bike, one of our best indoor cycling bike options, that can support up to 275 pounds with ease. It’s easy to move when needed so you can roll it out of the way when you need the space for something else. The fully adjustable seat and handlebars make it a perfect fit for you and then allow you to change it up to fit anyone else in your family as well. There’s even an adjustable resistance system so you can get more or less resistance as you need it. Just adjust to your personal needs and then the next person can adjust it again as needed. The heavy duty crank makes it sturdy and secure while the smooth chain drive means that it’s going to operate the way you expect it to every time. Adjustments are easy and the foot pedals even have cups to hold your foot in place so there’s no risk of slipping and sliding while you pedal. 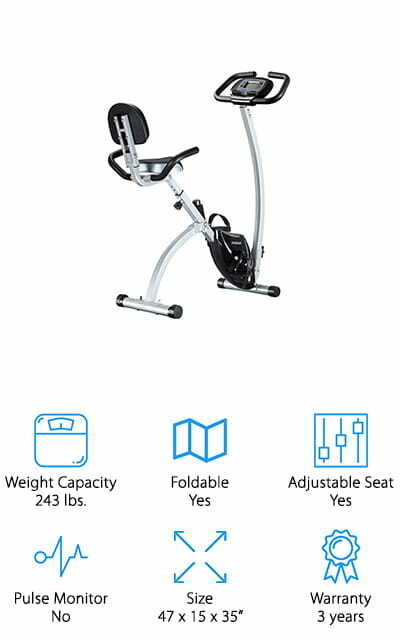 If you want the best indoor spin bike that’s going to allow you a little bit more reclined position while you ride this is a great choice. It’s budget friendly and it’s going to be easier on some of your joints at the same time. The step through design makes it easy to get on and the 14 gauge steel tubing is durable and long lasting. There are 8 different resistance levels to make sure it’s comfortable for you or anyone else who wants to use it and the computer screen is LCD to make it easy to read. You’ll be able to read time, speed, calories burned and distance on the screen in easy, large print numbers. On top of that, the seat is padded and ergonomically designed to make sure that you’re comfortable while you go. There’s even foam over the handles to provide you with additional support and the pedals are weighted to give you support and control. 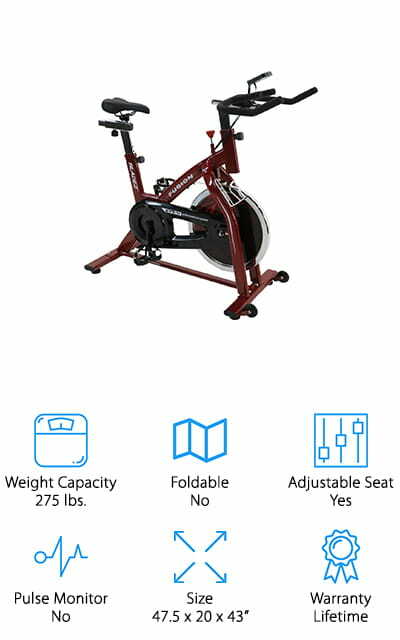 This best indoor exercise bike is moderately priced and features racing style handlebars that can be adjusted up and down as well as front and back to make sure you have a comfortable fit. The bike itself comes in a deep red color that’s definitely going to be sleek and stylish and it even has an anatomically designed, sport style seat. The seat is also able to be adjusted both forward and back and up and down to get you just the right level of comfort while you ride. You’ll also be able to easily make any adjustments that you need so you can ride and then someone else can try it out. Keep track of everything you need to know about your ride on the LCD console at the front which will show you distance, speed, time and calories. With a weight limit of 275 pounds and a 40 pound flywheel this is definitely capable of ramping up your workouts. This bike may not look like anything all that special but it’s definitely capable of getting the job done and helping you to get a great workout. 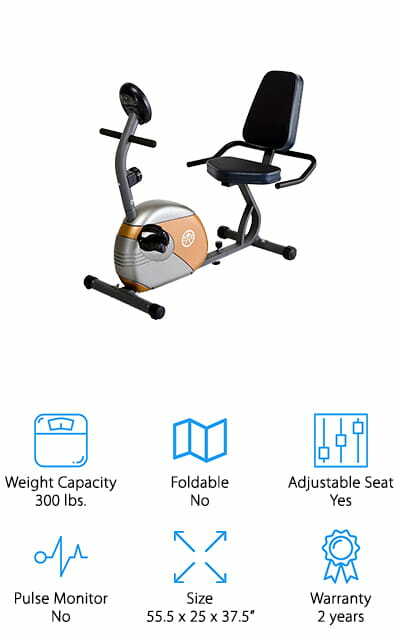 It has a high quality computer with a heart rate sensor and LCD display and it’s able to be adjusted down to work as an indoor recumbent bike or an upright. That means you can easily move it around to get just the workout you’re looking for. There are 8 levels to the tension controls and the seat cushion can be adjusted to get an ideal fit for a range of users. The steel frame is designed to support up to 220 pounds and it folds down when you’re not using it so you can get it out of the way and use your space for anything else you might want. There’s even space on the unit itself to hold a book or your tablet so you can keep yourself entertained while you’re working out. 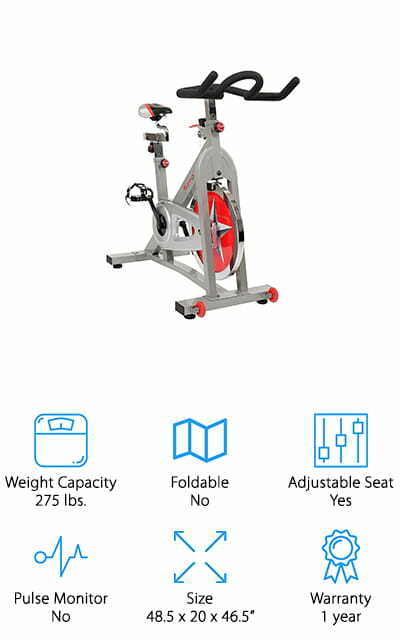 This indoor stationary bike gives you all the basics you could possibly need and a bit more. 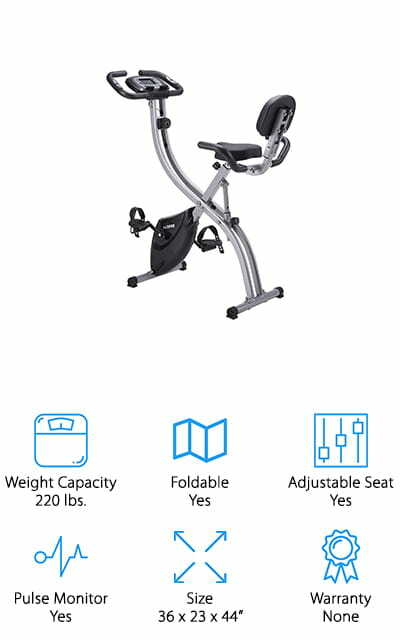 It’s inexpensive with an adjustable seat to fit users from 5’1” up to 6’ and it’s fully foldable so when you’re ready to quit for the day you can fold it up and out of the way. You’ll even be able to roll it away when you’re finished so it can really be set off somewhere else when it’s time to prepare for company or another occasion. Completely durable and quiet during use you’ll have no problem getting right to it no matter what’s going on around you. The magnetic tension control provides you with several different levels for your own comfort and the LED monitor gives you distance, calories, time and speed so you can continue to improve and work on your exercise needs. The multi-function stand even makes it possible for you to set up a book, tablet or anything else you might want to work on while you ride. This bike definitely looks like something special and in fact, you might not even mind having it sit out in your home because of how great it looks. The low price definitely doesn’t hurt either. You’ll have fully adjustable handlebars and seat to make sure it’s a good fit for just about any user and the system uses a belt drive to keep it smoother and quieter than some of the competition. There’s even an adjustable resistance system with press down breaking. 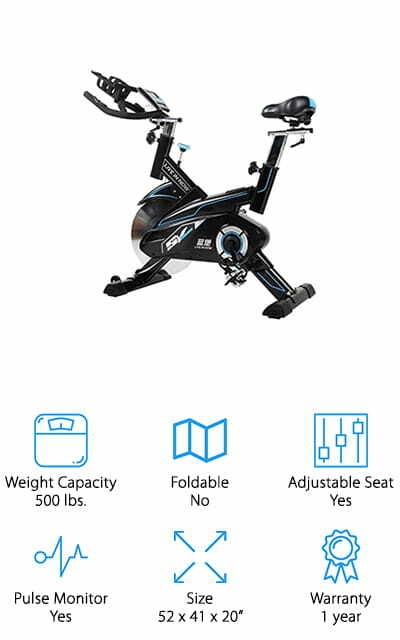 When you need to move it out of the way you can use the wheels that are already attached and while you’re riding the screen tells you your time, speed, distance and calories. Foot cage pedals make it easier to keep your feet where they need to be and a 330 pound weight limit means that it’s a great choice for just about anyone to get started working out again or to continue their plans. 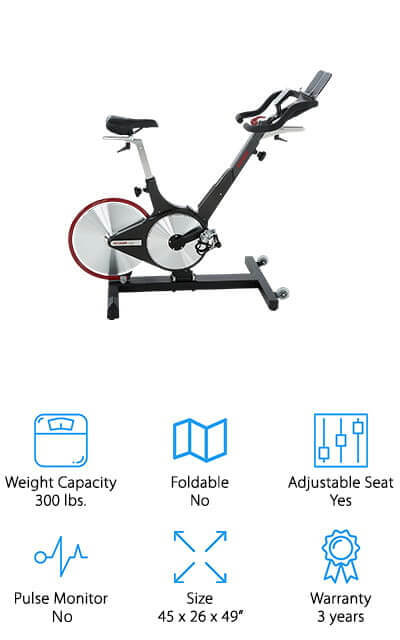 This best indoor bike for sale has some amazing features. It has a fully adjustable seat and handlebars to make sure that you can be comfortable riding as long as you want. It also has an automotive grade belt system to keep your workout super smooth and super comfortable. The 40 pound flywheel is bidirectional, which means you can switch between different exercises with no problem. It also has an LCD monitor that will show you time, distance, calories, speed, heart rate, RPM, and ODO. The handlebars themselves have microfiber that helps you grip as long as you want and there’s even a water bottle holder and a multimedia stand to listen to music, read, play games, respond to email or anything else. Able to support up to 500 pounds it has seat adjustments between 36” and 43”. There are even wheels to make transportation easier. 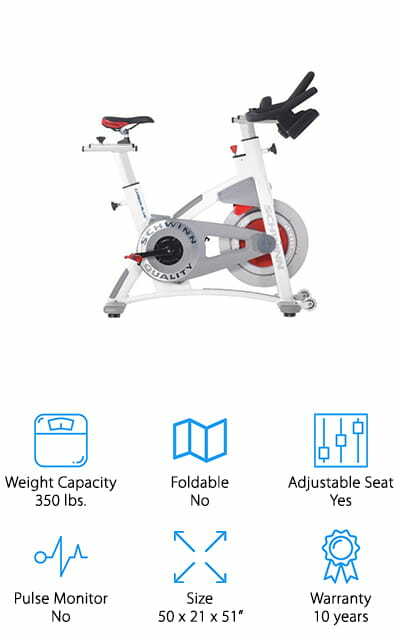 This Schwinn indoor cycling bike is going to prepare you for anything you might want to do. The frame is made with aluminum to keep it lightweight and rust free and the 6 magnet brake system means that you have complete control. The belt drive uses carbon blue that makes it feel more like riding your regular bike outside and ensures you have very little maintenance. The double link pedals have SPD and toe-clips so you can keep your shoes firmly attached while you’re riding. There are ErgoLoop, aero bars and you can set up to 12 degree incline to get better comfort and a better workout at the same time. When you’re ready to ride this bike will accommodate riders up to 350 pounds and between 4’11” and 6’8”, which means the whole family can ride.